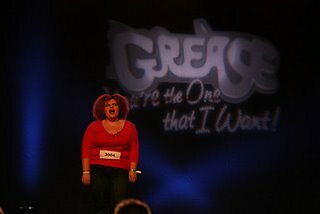 The Playgoer: "You're The One That We Want"
"You're The One That We Want"
Now it's hard to muster outrage over anything to do with any production of "Grease." And I actually find myself not worried one bit over the integrity of the American theatre, since who really cares who stars in yet another plastic B'way revival. The people who shell out the bucks for that will deserve what they get, which is to see two famous-for-15-minute nonentities attempt a two-hour singing 'n' dancing stunt. What is outrageous, though, is how lame a tv show this is. This is where I should disclose my guilty pleasure enjoyment of "American Idol." What can I say, deluded people proudly exhibiting their flaws to stunned-silent response never fails to crack me up. But watching a cheap imitation like this show makes you realize how good the Fox people really are at this stuff. "Idol" is brilliantly paced, immersing you in the audition room for sometimes long stretches, immediately getting you up close with both judges and contestants. Plus, they make sure you see only the very best, and very worst contestants. In "You're the One" they race through 10 really mediocre auditions, and then break for commercial leaving you in suspense over what will happen to "your favorites." Favorites??? I'm still trying to tell pompador #1 guy from #2. Also, the desperate stretch of using "You're The One That We Want" as a catchphrase (as in "is that your final answer...") is just puzzlingly ungrammatical. That British mastermind "producer" and faux-Simon David Ian loves to go deadpan and pause for eternity while staring down each candidate so we can all hang on the words after "You're....". You see, either he says "You're the one we want to go to the next round" or "You're not it." But when after the 10th "you're the one" isn't this just weird? Okay, I'm sure no one else cares about that one. Actually, what he really says is "You're the one going to Grease Academy." Yes, "Grease Academy" is the next round. Or as I like to call it, Sha-Na-RADA. Finally, for a theatre lover, it's impossible not to think about what must be going on behind Kathleen Marshall's calm and perky exterior. Not one of the people selected in Episode 1 would make it past the first minute of a real Broadway cattle call. Yet she has to play ball and make nice about their few attributes. Seriously, the talent on display was somewhere between community theatre, karaoke, and prisoner rehabilitation. Think about this: the American Idol champ gets a prize and record contract, and can then be conviently forgotten once the novelty wears off and we wake up from the show's hangover. With these two winners, America will get to turn off the tv after the big vote. But Marshall will have to live with them for 4-6 weeks, plus the run of the show. Plus, the audience will have to suffer their performances night after night. We're not talking Fantasia or Clay Aiken, folks. There are real consequences here! Of course, the dirty little secret may be...the ringers. As Campbell Robertson explained in the recent Times article, the rules are not excluding fully pro Equity folks from competing side by side with the "enthusiasts." Unlike “Idol,” “You’re the One” is not supposed to be exclusively an amateur night. The rules of “Idol” require that contestants not have any current contracts or talent representation; “You’re the One,” on the other hand, is simply an open casting call, for novices as well as active Broadway performers. A prospective Danny in the first episode, for example, has several national tours under his belt. But that is part of the show’s tricky balancing act. Reality television producers and viewers still love the nobody from nowhere who wins it all; the first episode puts heavy (and at times, teary) emphasis on the contestants’ personal stories. But the winners also have to hold up a $10 million musical eight times a week for at least a year, a demanding feat for a total greenhorn. This is where David Ian might have an interesting choice to make. As producer of both the TV program and the subsequent Broadway revival, does he go for solid dependable professional chops that will deliver a good show? Or, does he bet on the sheer novelty of "the carpenter" (what was that, some Christ reference???) approach paying off? What, you say? Could the casting of untalented celebrities (even 15-minute celbrities) really outperform actual quality at the box office? Never. Of course, the most unsettling thing of all is this guy. Billy Bush. And, yes, he is a Bush Bush. If you thought there was no blander cipher than Ryan Seacrest... you were wrong. Plus, the W resemblance (especially in his "cheerleader days") is the scariest thing about the whole show. Postscript: According to Variety the show worked. $1.3 mil in instant ticket sales for the Broadway "Grease" after the broadcast. American Idols conceptually is exploitive but nonetheless, most of them arent bad at what they do. Calling their flaws is one thing but to actually say you like the show because of their flaws then doesnt this negate the fact? I like it because it's so horrible to watch but I can't seem to stop watching. Preach what you teach. The thing is that Fantasia and Clay Aiken are fantastically talented. These guys? Not so much. You're the One We Want must be the east coast answer to The Starlet, which I watched through to the ludicrous end. Much more satsifying was a British documentary that followed the career paths of two young graduates of drama school in Britain. It was broadcast on the late great cable station known as Trio. Can't remember the name of the show, but it dealt with -- I don't know how else to put it -- the real reality of trying to make it in show biz. I believe the British doc Village G. is referring to is "The Theatre Biz" and it is indeed great! There are 3 episodes, and the one referred to follows to actresses out of either LAMDA or Central School. Funny to see the Brits do the horrid American-template "Industry Night." Only 2 or 3 other episodes, I think. One goes behind the scenes with a couple of colorful West End producers and their ventures with high-art shows like "Brand" and "Woman of No Importance." They even go to New York for a hilarious scouting of the sorry Whoopi Goldberg revival of "Ma Rainey." (Like other duped audiences, they assumed it would be a Whoopi musical. )...Another great episode shows what goes into an Edinburgh Fringe production (the perplexing "William Shakespeare's Italian Job") and its desperate attempt to transfer to a London commercial venue. (Yes, just like Fringe NYC! )...And the last episode, I think, focuses on the actor's life. Highlight: Henry Goodman going on the record about his public humiliation at the hands of The Producers' Producers. The good news is that while Trio has bit the dust, I'm sure I've seen the show lately surface on the equally fine "Ovation" cable channel. "The Theatre Biz". Look for it. What makes me really mad is the fact that it works so well. What does this say about our audiences? If this starts to become the norm, then the industry will be swamped by talentless nobodies who don't have the stamina to get them through 8 shows a week and who think they "deserve" this because they've stood in line at an audition. Playgoer, While I am an avid fan of the theatre I am no writer. Thank you for articulating so precisely what I was feeling while watching "Your'e The One..... . It's so funny how you mentions the announcement to stand by to learn the fate of our favorites.....I was thinking the exact same thing. What? Favorites? I thnik we are getting ahead of ourselves. Although, I must admit that the concept is a little intriguing. As you say, there is a lot at stake. With regard to Kathleen Marshall, I thought she displayed amazing restraint. Someone on Craigs, in a recent discussion about the show referred to her as (I'm paraphrasing) a no talent wannabe. Can you imagine? I swear I've watched that Pajame Game sequence from last year's Tonys on the Tivo at least 500 times. If anyone can make this whole thing work, I'm guessing she can. Anyway, love the Blog.